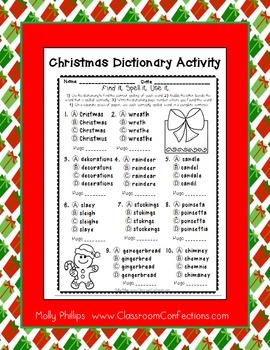 This is a fun little Christmas activity where students 'find it, spell it, use it."... meaning that they will find the Christmas themed word in the dictionary and write the page number where they found it, they will bubble in the correct spelling, and then on a separate piece of paper they will use each of the ten words in a sentence. On the spelling sections of standardized tests, this is typically the format for spelling, where students have to look at four spellings of words and pick the one that is spelled correctly. So, it is a good review for that. This will make for a great literacy center the week of Christmas or just use as an individual or partner activity. Be creative and use it however you would like in your classroom. Don't forget to check out my other Christmas themed activities. Just do a search in my store for 'Christmas" or click on the category on the left side of my store homepage. For other creative lesson ideas, click on 'elementary lesson plans' by my picture above.